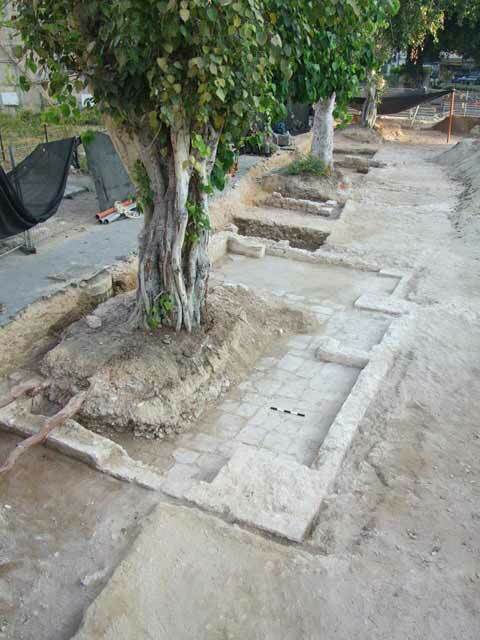 In October–November 2012, and in February–June and October–November 2013, salvage excavations were conducted in the Magen Avraham Compound in Yafo (Permit No. A-6610; map ref. 177273–363/661945–2101), prior to infrastructure construction. The excavations, undertaken on behalf of the Israel Antiquities Authority and financed by Ha-Mishlama Le-Yafo, were directed by Y. Arbel and L. Rauchberger, with the assistance of M. Schiff, T. Greenwald, M. Hater and H. Vanda (area supervision), R. Bar, S. Ishoev, N. Ben-Melekh and Y. Hartstein (recording and area supervision assistance), R. Mishayev, M. Kahan and M. Kunin (surveying and drafting), A. Dagot and H. Ben-Ari (GPS), Y. Amrani and E. Bachar (administration), A. de Vincenz (Byzantine, Islamic and Ottoman ceramics), E. Stern (Crusader ceramic consultation), M. Ajami and D. Barkan. The compound, located c. 450 m southeast of Tel Yafo and bounded by the flea market on the west, Jerusalem Boulevard on the east, Olē Ziyyon Street on the north and Yehuda Ha-Yammit Street on the south, had not been excavated previously; however, numerous excavations were conducted at nearby sites: on Yehuda Ha-Yammit Street (Haddad 2010; Arbel 2012), Jerusalem Boulevard (Jakoel 2011), Olē Ziyyon Street (Permit No. A-5640) and on Rabbi Yehuda Me-Raguza Street (Permit No. A-6482). These excavations uncovered architectural remains from the Hellenistic, Roman and Byzantine periods; ceramics from the Early Islamic and Crusader periods, not associated with architecture; and streets, buildings and canals from the Late Ottoman period and the British Mandate. In addition, pit graves with Muslim characteristics were found, but could not be clearly dated. 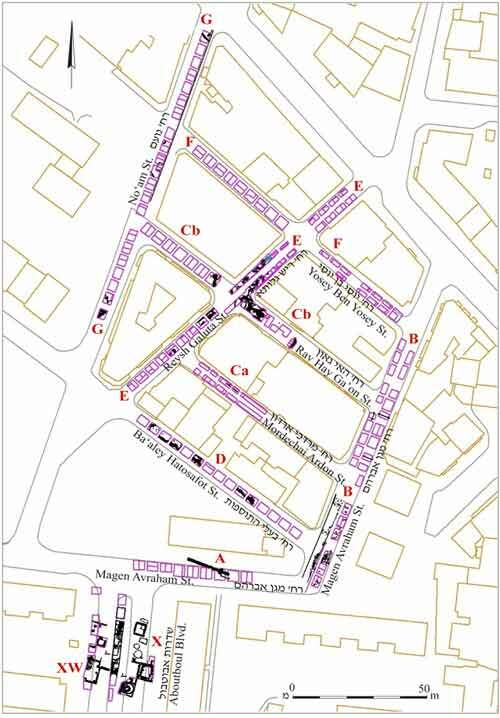 Ten excavation areas were opened, on eight streets (Fig. 1): Areas A and B on Magen Avraham Street, Area Ca on Mordechai Ardon Street, Area Cb on Hai Gaon Street, Area D on Ba‘alei Ha-Tosafot Street, Area E on Reish Galuta Street, Area F on Yosi Ben Yosi Street, Area G on No‘am Street and Areas X and XW on Aboutboul Street. 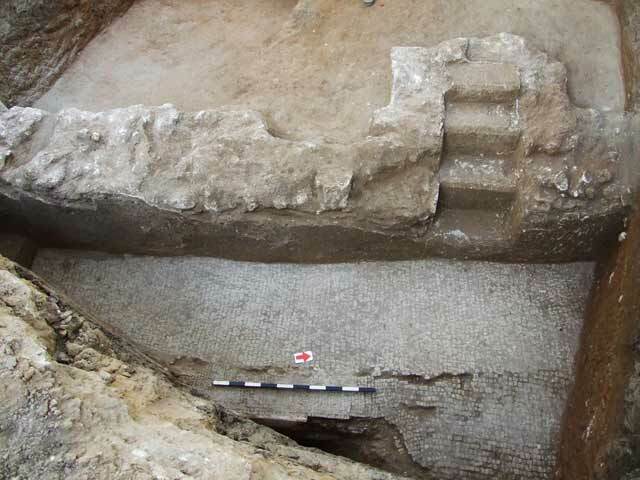 The excavation squares were of various sizes (most of them 4 × 4 m) and were excavated to various depths (1.0–3.7 m). Size and depth were determined by constraints of existing infrastructure and by safety considerations. The excavations exposed an industrial liquid-extraction installation dating to the Byzantine period; a well-house and a well-preserved base of an irrigation canal from the Ottoman period; and the foundations of paved streets dating to the British Mandate. The pottery, glass and coins date to the Hellenistic, Roman, Byzantine, Early Islamic, Crusader, Late Ottoman and the British Mandate periods. Stratum V (Hellenistic period, third–second centuries BCE). The period is represented by a low concentration of pottery, usually found in later strata. 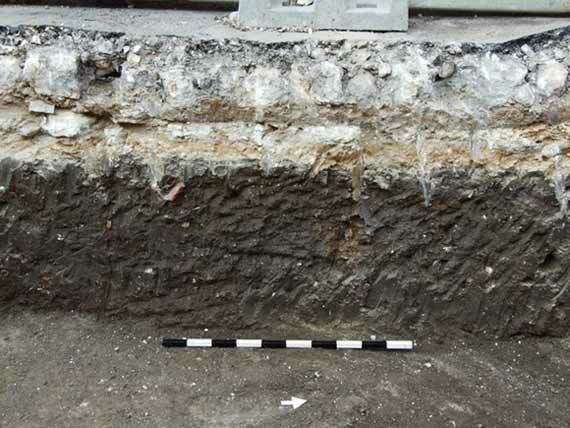 Uncontaminated concentration of Hellenistic-period pottery was found only at the bottom of several pits, in reddish soil that was distinct from the darker soil above it (see Stratum III), which contained later finds. Fragments of jars, cooking pots, bowls—locally produced and imports, some with a black or red slip—were found. Several handles bearing seal impressions were among the fragments of imported amphorae. Stratum IV (Byzantine period, fifth-seventh centuries CE). Remains of a large, industrial liquid-extraction installation were revealed in Areas Cb and E, at a depth of 1.7 m. The installation was partially exposed. Parts of ten surfaces, paved with white industrial mosaics and separated by plastered partitions, were exposed. Approach to the installation was by way of steps that were built into the western boundary wall and descended from ground level to one of the paved surfaces (Fig. 2). At least three of the surfaces were connected to circular collecting vats by means of clay pipes that passed through purpose-made holes. The collecting vats were coated with pinkish plaster, and narrowed toward the bottom (diam. at top 1.00 m, diam. at bottom 0.55 m, depth c. 0.80 m; Fig. 3). Since the vats are not linked to each other, there is no doubt that they are collecting vats. Their dimensions are considerably smaller than those of collecting vats in industrial winepresses, and it seems therefore, that the installation produced liquid other than wine. Repairs and renovations can be traced on some of the mosaic surfaces, probably dating to the original operation of the installation. There is no sign to significant hiatus, or to changes in purpose or function (Fig. 4). The ceramic that was recovered from the stratum into which the installation was dug, and from the soil that accumulated over it, dates the beginning of its activity to the Byzantine period, and its end in the Early Islamic period, although it may have continued to operate through part of it. No parallels for this installation have been found to date, and the state of research does not make it possible to determine the liquid which was produced in it. Stratum III (Early Islamic–Crusader periods, eighth–thirteenth centuries CE). No buildings or installations were exposed; however, fragments of pottery and glass vessels from these periods were found in all the squares that were excavated to below the Ottoman stratum (Stratum II). Most of the sherds are of storage jars and there is a small quantity of cooking pots, but hardly any bowls, serving vessels, lamps or imported vessels. The dark compacted earth in which the sherds were found is suitable for cultivation, and the types of vessels that were found in it are characteristic of assemblages that are associated with agricultural work outside settlements (Fig. 5). Most of the vessels are from the later phase of the Early Islamic period (tenth–eleventh centuries CE), although there are also a few Crusader-period imports. Certain types of the storage vessels may have remained in use during this period. Stratum II (Ottoman period, nineteenth–twentieth centuries CE). Pottery from this period was found in the upper levels of streets throughout the compound. 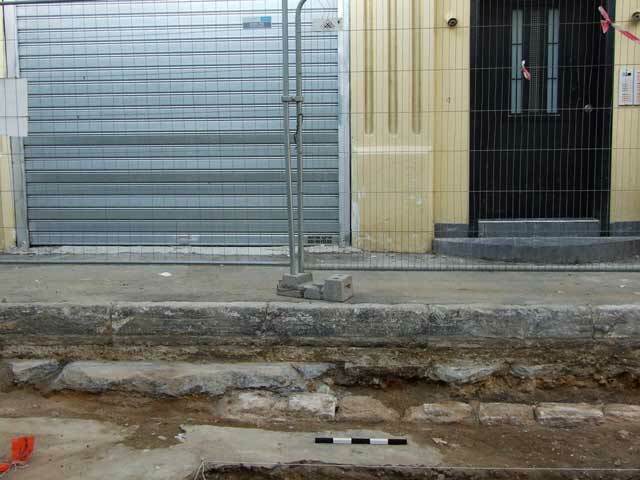 Architectural remains, however, were found only in Areas A, X and XW, below the pavement and the asphalt surface of the road. A well-house complex consisting of several rooms and a large well (L16, depth 6.5 m—the depth of the sea level at this point; Fig. 6) was uncovered in Areas X and XW. 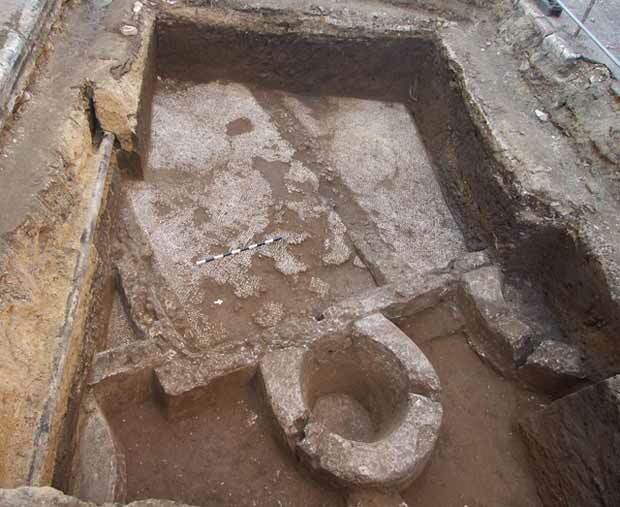 Well-houses in various states of preservation are extant in Yafo and south Tel Aviv, but this is the most complete complex to be uncovered in an archaeological excavation. The well and its associated buildings were exposed in Area X, on the eastern part of the boulevard. 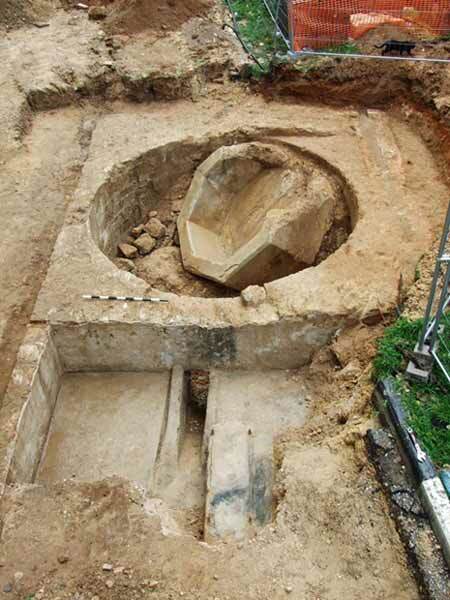 The well, which was lined with dressed stones, was only partially excavated. North of the well and adjacent to it, was a room (L41) that contained the remnants of the base on which the engine, which replaced the original water-wheel (saqiya), was mounted in the late nineteenth or early twentieth century CE. Fragments of the large pottery vessels that drew the water by means of the saqiya were scattered in the vicinity of the buildings (Ayalon 2000:216–220; Kark 1990:239–245; 1998:534–535). Plastered canals carried water from the well to reservoirs that remain undiscovered, or to irrigate cultivated plots. The rooms around the well were constructed of dressed kurkar stones, consolidated with a compact, reddish mortar. Some of the rooms were supported by foundation arches. This is a construction technique which is typical of the Late Ottoman period in Yafo. Plaster survived on some walls. The multiple layers of the plaster floors and the relation between the walls, indicate at least two construction phases in the complex, and possibly three. A large building (L76; Fig. 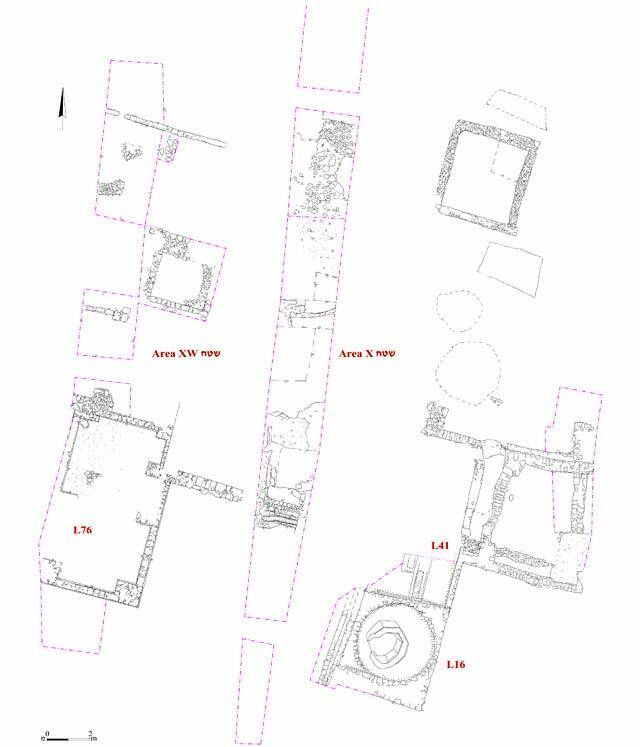 7) with flagstone floors was exposed in the western part of the complex (Area XW). It had thick corners, which may have supported vaults. It is the best constructed and best preserved building in the complex. A very similar structure appears in an artistic illustration depicting a well-house and the orchards of Yafo, viewed from the American Colony in the 1860s. Several structures that may have been used as storerooms were exposed north of the building and the well. In Area A, northeast of the well-house, a section of an irrigation cannal (L115, length c. 16 m; Figs. 8, 9) built of kurkar stones bonded with red mortar was discovered; remains of white plaster belonging to the floor survived on the upper part of the canal, which was well built, along a straight and precise course. At its eastern end, a side branch transferred water to flowerbeds between the cultivation plots. 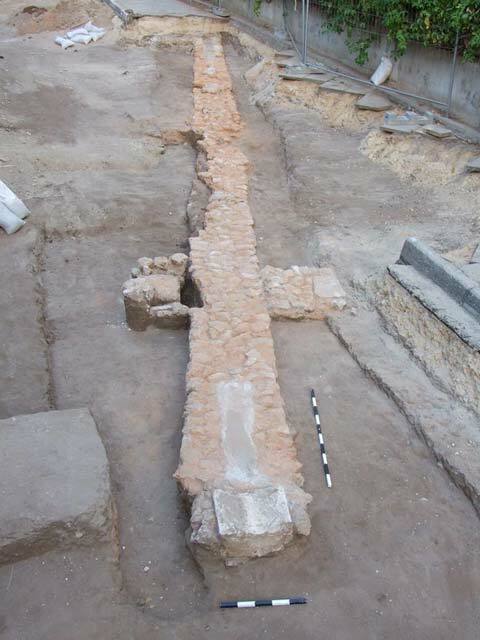 This is the longest section of an irrigation canal to be uncovered so far in the orchards of Ottoman Yafo, but due to the limitations of excavation in a city it does not truly reflect the magnitude of the phenomenon. An example can be seen in similar canals that were excavated in an open area near Nes Ziyyona (Golan 2015). There they extended over a distance of c. 80 m, with regulating channels branching off at several points. Stratum I (the British Mandate and up to the 1950s). The well-house underwent many changes during this phase. The engine was probably installed in the early years of the British Mandate, or the final years of the Ottoman period. A chute-like diagonal surface was incorporated between the floor of the room that is adjacent to the well on the north (L41) and the northern side of the well. Kurkar stones were removed from the northern side of the well in the course of this construction, and once it was completed, the gap was sealed with concrete. There is no evidence that other parts of the well-house were in use at this time, and the complex, with the exception of the well, may have been abandoned by then. It is quite likely that some of the well-house buildings remained intact, even if unused, until the construction boom which followed the establishment of the State of Israel. At that time, the street was paved and buildings were erected along it. This development continued a trend that began during the Mandate period. Nearby Yehuda Ha-Yammit Street is a typical mandatory-period street. The development boom put a stop to the operation of the well, and the abandoned buildings were razed to the ground. Mechanical equipment was used in the demolition, and parts of the walls were discarded into the well itself. Among the items clogging the well was an octagonal basin of a fountain that had probably been in a nearby courtyard (Fig. 10). A similar basin, built of kurkar and cement, which was found in excavations on Mifraz Shelomo Street (Arbel, Hater and Yechielov 2012) ascribed to a fountain of an Ottoman bathhouse that stood there in the nineteenth century. The basin from Aboutboul Street was made of concrete reinforced with shells, a characteristic construction of the Mandate period. In Areas B, Ca, Cb, D, E and F, 0.4–0.6 m below the modern asphalt, an infrastructure of pathways was exposed. These comprised a top layer of tamped earth mixed with slaked lime above layers of crushed limestone and compacted soil. The paths were paved when the urban sprawl of Yafo expanded into the surrounding agricultural areas. Soling roads, constructed on a bed of broken stones (Fig. 11), were built in time on top of these paths. These streets appear on the British Mandate maps, and in the northwestern part of Area F, their curbstones were discovered underneath the modern sidewalks (Fig. 12). 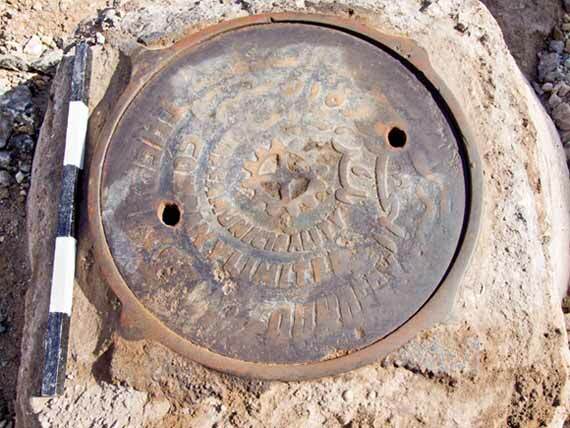 Another element of the Mandatory infrastructure are two original iron manhole-covers bearing the name of the then Yafo municipality in English and Arabic. The two were preserved in situ as part of the modern road in Area B (Fig. 13), but were replaced during the subsequent road development. Similar covers remained until recently in other streets in Yafo—the best preserved was in Dror Street, next to the intersection of Yehuda Me-Raguza Street—but were removed under similar circumstances and disappeared. 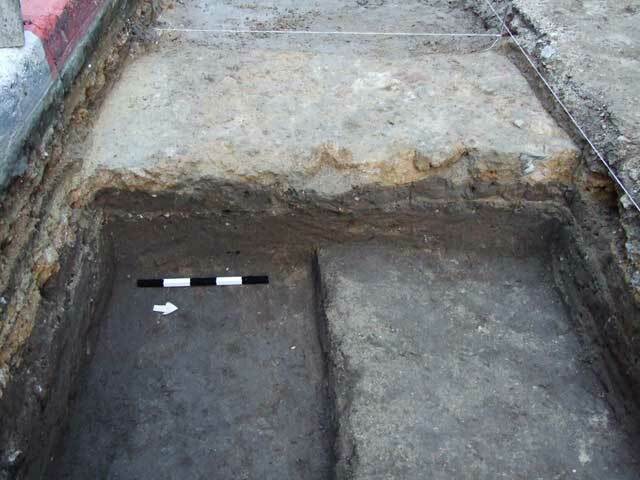 Another find from the same period were amorphous lime pits that supplied building materials for the construction of the adjacent structures and were then filled with debris and earth, prior to the paving of the street. Area D contains a particularly dense concentration of lime pits. Dressed kurkar stones were found scattered next to debris that dates from the Mandatory period to the 1950s in most of the streets. The building stones had probably fallen from ruined buildings of the Late Ottoman period before the streets were paved and new buildings erected. The excavations in the Magen Avraham Compound add evidence to that of other excavations—recent ones on Yehuda Ha-Yammit Street to the south and current ones in the Ben Gamliel compound to the north (Permit No. A-7071)—to demonstrate that these areas were never part of the city of Yafo, but rather they were agricultural areas with farms, well-houses and installations for processing agricultural produce. This was the case already in the Hellenistic period, although on an unknown scale. After a hiatus in the Roman period, from which there are almost no remains in this part of the modern city, the area was utilized again for agricultural purposes during the Byzantine period. The industrial installation probably stood in the middle of a densely cultivated area, where unidentified crops included those that were process in it. The discovery of industrial winepresses in the flea market complex (Peilstöker et al. 2006) confirmed the presence of vineyards in the vicinity of Yafo in these periods. It is now thought that another fruit was locally grown in quantities that justified extraction and processing on an industrial scale. The installation that went out of use and the many ceramic finds that had no architectural context, reflect the agricultural nature of the compound, and indicate that probably the crops in it changed between the Islamic and the Medieval periods. In the Ottoman period the Magen Avraham Compound was within the famous orchards of Yafo. The orchards were irrigated by an extensive network of canals; the irrigation was regulated and controlled by the well-houses that were scattered between them, like the well-house that was uncovered in the compound. This system was gradually eradicated during the British Mandate with the increasing urban sprawl, and almost completely vanished with the construction boom in Yafo after the War of Independence. Arbel Y. 2012. Yafo, Yehuda Ha-Yammit Street. HA-ESI 124. Arbel Y., Hater M. and Yechielov S. 2012. Yafo, Roslan and Mifraz Shelomo Streets. HA-ESI 124. Ayalon E. 2000. Typology and Chronology of Water Wheel (Saqiya) Pottery Pots from Israel. IEJ 50:216–226. Haddad E. 2010. Yafo, Yehuda Ha-Yammit Street. HA-ESI 122. Jakoel E. 2011. Yafo, Jerusalem Boulevard (East). HA-ESI 123. Kark R. 1990. Jaffa, a City in Evolution 1799–1917. Jerusalem. Kark R. 1998. The Introduction of Modern Technology into the Holy Land (1800–1914 CE). In T.E. Levy ed. The Archaeology of Society in the Holy Land. London. Pp. 524–541. Peilstöcker M., Re’em A., Haddad E. and Gendelman P. 2006. Yafo, Flea Market Complex. HA-ESI 118. 2. Area Cb, steps descending to the mosaic surfaces of the industrial installation, looking west. 3. Area Cb, treading floors and collecting vats in the industrial installation, looking northwest. 4. 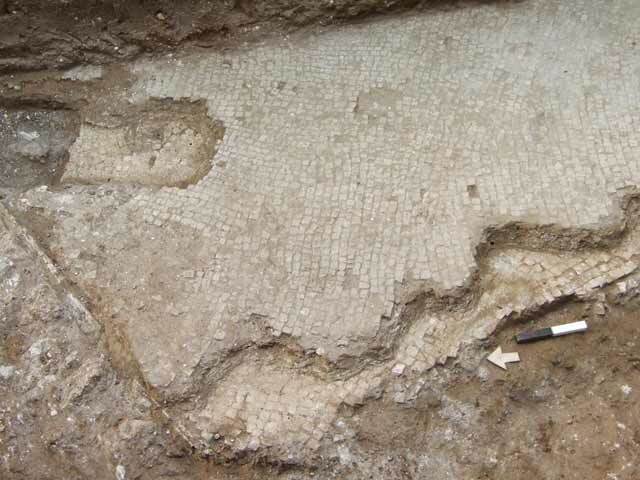 Area E, two layers of mosaic pavement, looking east. 5. Area C, the layer of dark soil containing Islamic–Crusader finds, looking west. 6. Area X, plan of the well-house from the Ottoman period. 7. Area XW, the western part of the well-house from the Ottoman period, looking north. 8. Area A, plan of the irrigation canal from the Ottoman period. 9. Area A, the irrigation canal from the Ottoman period, looking west. 10. Area X, the fountain basin discarded in the well, looking south. 11. Area B, a typical cross-section of a soling road from the time of the British Mandate, looking west. 12. Area F, curbstones of a street from the British Mandate underneath the modern sidewalk, looking north. 13. Area B, a manhole cover from the time of the British Mandate, integrated in the modern street.